Starbucks Rewards is back with another “must activate” promotion sent to people’s emails. I do not know if everyone receives this offer or not, so YMMV. You have to find the email or the notice in the app to activate it, otherwise you won’t receive any bonus stars. The promotion is running December 28 until the end of day on January 3 in 2017, that’s seven days. 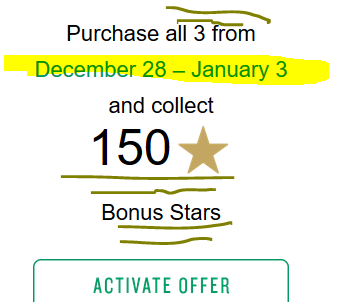 The 150 Bonus stars will be added to your account by January 10 in 2017. The offer is “one time use” per account, meaning you can only earn 150 Bonus Stars regardless of how many times you buy the trio. 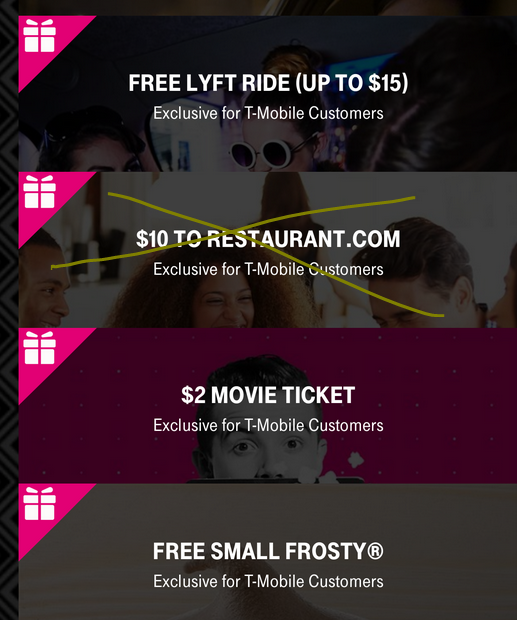 Last week was perhaps the best T-Mobile Tuesday of the year (perhaps they saved it for Christmas), but the Tuesday December 27 freebies are not bad either. You get the option to buy a $2 Movie Ticket, which is pretty good considering it’s double figures now for a movie ticket. They also have two returnees, the Wendy’s small Frosty, and a free Lyft ride (up to $15). With Uber being the dominant service, it makes sense for Lyft to be aggressive offering with free rides to get people to try/use their service. If you are looking for a basic but name-brand mousepad, slightly less than 8×10 inches in dimensions, and you are willing to place a $25+ order at Amazon.com, then you can get up to twenty Belkin Standard 7.9”x9.7” Mouse Pads for $0.97 each. These are new condition. The price can change at any time, it is not a lightning deal. It has been trending down the last few days. 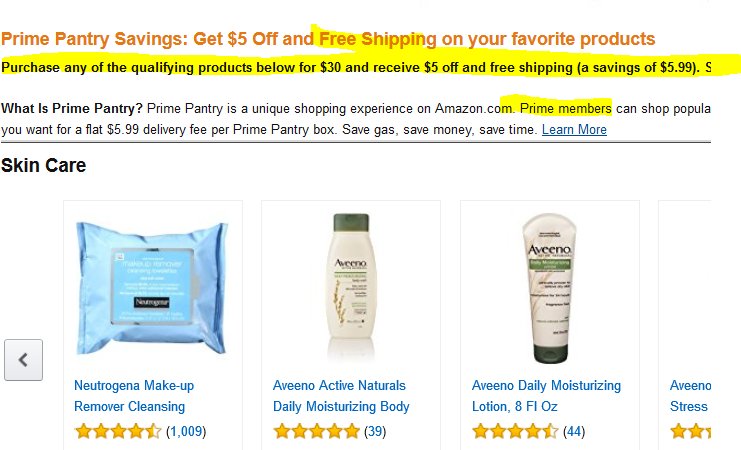 It is an Add-On item, so you must needs place an order of $25 or more in products that are sold or fulfilled by Amazon. Their shopping cart won’t let you buy it otherwise. The restriction applies to all shoppers, including Prime members. You can’t buy it on its own and pay shipping for it. The shopping cart refuses to let you proceed. PS: the Add-On program was created as a counterbalance to free 2-day Prime shipping, because getting free 2-day shipping on a $1 mouse is probably was Amazon a noticeable loss, even with the annual Prime membership price factored in. Prime Pantry strikes again with another promotion! This is even better, because you get both a discount AND free shipping. And that’s without using any previous “slow shipping credits” you may have had. The promotion is similar in style as before. You have to buy $30+ in products participating in the promotion. The number of products doesn’t matter as long as the total is $30. Then you will receive $5 off your order total amount, AND free shipping too! They have to fit in the “Pantry Box” as usual. Only four product categories are participating in this promotion, so it may be more difficult to get to $30 if you don’t need a lot of different items. But you can buy up to ten units per individual product, so you could easily get to $30+ by buying more of your favorite items. This won’t last long, so don’t sleep on it! A Christmas Day surprise, the Peets website has launched a clearance sale with free shipping (regardless of amount of clearance items) AND an additional discount of up to 50% off with coupon code SALE. That’s right the price is red you see there is BEFORE you enter coupon code SALE in the shopping cart! 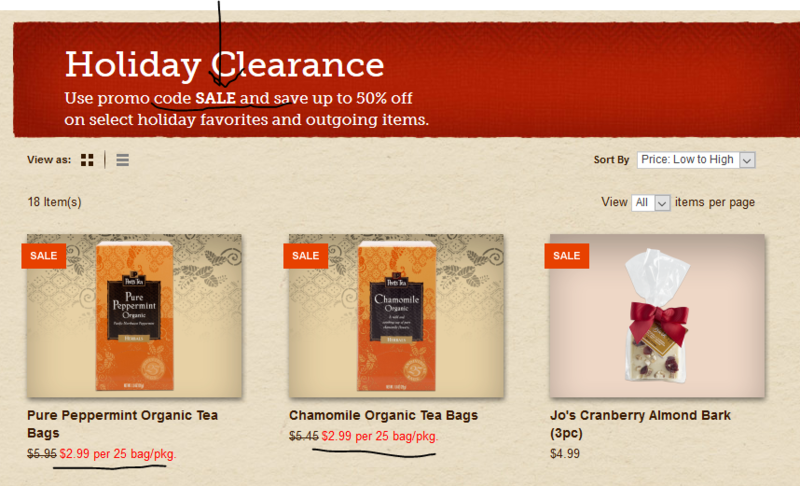 This drops the price of their 25pk of herbal teas (Organic Peppermint or Chamomile) to $1.79 each, with free shipping. You can buy as many as you like as long as they have them available. Already, the “Xiao Blend” sold out. A couple of coffee/tea presses are also part of the sale. The 16oz plastic BPA-Free travel cup drops to under $7 after coupon, and so does the 16oz borosilicate glass. Free shipping even if you buy one of them. This is a very limited time offer, and these can sell out very quickly, so YMMV! This is a great deal. For just $0.99, you can rent any movie, including new releases, HD and without ads, at Amazon Instant Video when you enter coupon code MOVIE99 over there until 1/23/17. You don’t have to watch the movie right away. You can enter the coupon code right now, but rent the movie at any time until the deadline. More details on the promotion, along with official instructions at the Amazon Instant Video promotional page. The paperback edition of Patrick Rothfuss’s story “The Slow Regard of Silent Things” is now down to $5.27 at Amazon by Amazon actual. This is significantly less than the Kindle version, and if you are a Prime member, you get free shipping on the book even if you don’t buy anything else! This is not a lightning deal, so the price can fluctuate at any point in time. IF you need a Chromebook right away, and don’t want to wait for the newer CES 2017 models that may have support for the “Chrome Droid” (Android app support), there is an instant savings promotion running that can get you up to $50 off select models by ASUS, Acer and HP through amazon.com. If you are not sure which existing models support (or will support) “Chrome Droid”, check (and bookmark) this support page at the Chromium project. TIPS: even though ChromeOS is a lightweight OS, the web itself is getting more and more bloated, which increases the minimum specs necessary for a lower-frustration web browsing experience. As such, I would recommend avoiding 2GB RAM models unless you plan to use them in a uni-tasking type of fashion. Touchscreen still adds significantly to the price, but if you are not interested in running Android apps, the lack of a touchscreen opens the door to even lower prices. If you buy a lot of general use items (grocery, household, wellness and such) from Amazon, this is a superhot deal to end the year. If you spend $75+ on the items shown on those four tab-categories over there, you will get a $25 off discount on your order total. The maximum you can buy for this promotion is up to two units per item, so you’d have to get to $75+ with a variety of products. Amazon actual has to be the seller, not marketplace sellers. You can find all the eligible products here. Terms and conditions at the bottom of the page. Browser the four sub-tabs (Grocery, Health & Wellness, Household, and Personal Care to find items of interest. Amazon calls these and this promotion “Holiday Essentials”. The offer runs until 12/31/16. I have complained for some sub-par T-Mobile Tuesdays the last few weeks, but we have good news! There’s a pretty good haul planned for Tuesday December 20 in 2016! Four solid and tangible promotions! One of them is to be picked up at your local T-Mobile store, so be sure to map out locations and opening hours since supplies are limited. 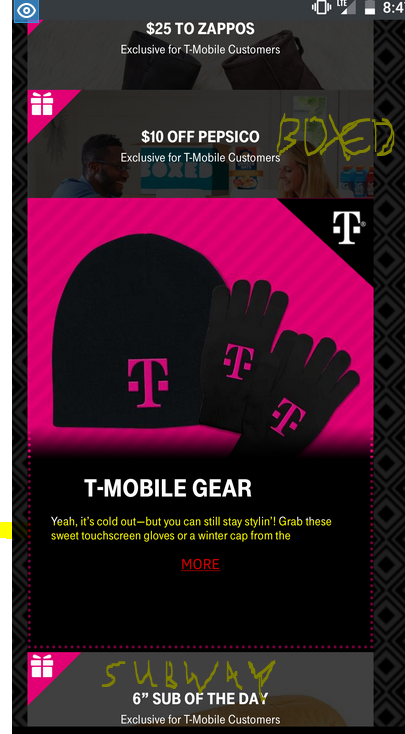 You get either a pair of touchscreen gloves or a beanie hat. I do not know if it is one per line or one per account. Time will tell when it goes live, and it may also be at the discretion of each individual store depending on their inventory. Once sent there, you have three business days to pick them up, so be sure you are going to be in-town and it’s somewhere you can walk if your car is at the shop. And things of that nature. Anyway, to cut a long story short, when you receive an Amazon email that your order was delivered to a local 711 store, you will also see a short paragraph with an offer, you get a FREE 711 Big Gulp with your first order picked up there. You click through the Amazon link which takes you to a 711 website, and you receive the coupon via SMS (the only option even if you open the email with a web browser on a desktop computer). A couple stackable promotion is currently running at Prime Pantry which is open to Prime members and typically has a $6 flat shipping per “box”. With this promotion, if you buy or more participating Kelloggs items, you will get both a 25% off discount on them AND free shipping. If you have any Prime Pantry “slow shipping credits”, they may be automatically deducted from the total as well. Running in parallel, there’s another promotion that gets you a free 24oz stainless steel (or aluminum) water bottle with a $60+ Prime Pantry purchase. Until December 27 in 2016, at Lucky’s grocery stores, they have two parallel promotions on gift card purchases. 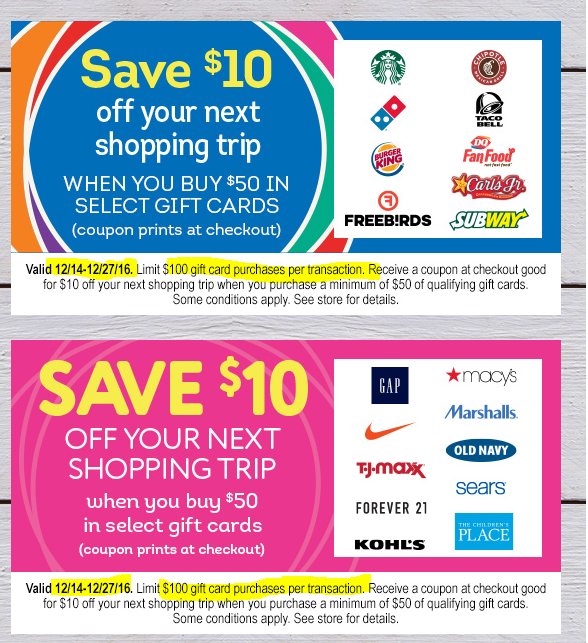 If you buy $50 or more of those gift cards, the cash register will print a $10 coupon that you can use on your next $10+ purchase at Lucky’s stores. You have to buy gift cards from the same group – it could be $50 in a single card or two of them or any combination that gets you to $50+. 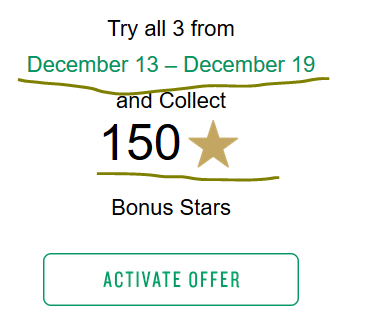 A new offer went out by email to Starbucks Rewards members. As usual, these may be targeted or rolling out on a staggered basis, so YMMV. This is an offer that you must first manually activate by clicking the button in the email. You get 150 Bonus Stars which is the equivalent of one full reward plus 25 stars, no small change! You have to buy three items to get it, the “Egg and Cheddar” breakfast sandwich (a $3 item), along with Any Salad and Any Bistro Box. You have to buy one of each, but not at the same time. The offer runs December 13-19 in 2016, so you have seven days to buy those three items.